Well, I thought I would pop in with one of those cheesy pregnancy update posts here and there, mostly just for me to look back on since somehow we all get amnesia when it comes to babies. How big is the baby? Pea pod? Peach? Size Me Up app says rubber duck. Total weight gain/loss? My biggest blessings in the first trimester is that I don’t throw up and I lose weight, so last time I was at the OBs I was about 5 pounds lighter than my before pregnancy weight (not pre-kids FYI), but pretty sure I’ve gained that all back. Let’s just say that the 9am ice cream sandwich eating probably isn’t helping. Maternity clothes? Well, I’m kind of a stink and don’t like to buy maternity clothes and would rather just wear flowy shirts, leggings, dresses, elastic waisted shorts, etc. But I did just make my first ever big maternity purchase and got a this pair of Madewell maternity jeans because all my high waisted jeans that typically contain the 3 baby pooch aren’t working anymore. I’m also living in these leggings. Sleep? I actually have been having some pregnancy insomnia and pass out early than wake up in the middle of the night and struggle with falling back to sleep, but this time change seems to have cured it!? Best moment this week? Ollie was really upset over something and asked if he could just cuddle the baby and snuggled into my tummy. Symptoms? My nausea is pretty much gone, but I’m still so tired. Constantly exhausted is what my first trimester usually looks like. Food cravings? Mostly ice cream, cereal, smoothies. All the dairy. Food aversions? Nothing specific actually. Just random things that sound awful one day and fine the next. Early on it was hamburgers and chicken!? So weird. Gender? No idea. I had a day when I felt so strongly that we were having a girl and we figured out her potential name, but then I think that night I dreamt I had a boy. This is the first time I think I haven’t had a strong pull towards either gender. We are seriously considering not finding out which feels so nuts for me because I am such a planner. Milestones? We got to see the baby at 10 weeks and he/she was SO active. When looking at the ultrasound I got little flashbacks to Atlas’ ultrasounds then got emotional thinking about another babe like Atlas man. 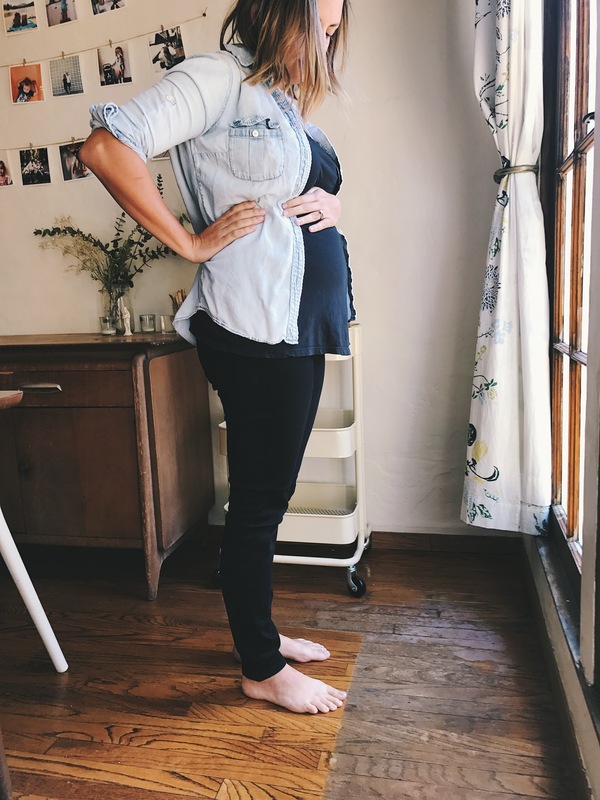 Good to know about those Madewell jeans, I think next time around (God willing) I need to invest in some sturdy maternity jeans. I wore my cheap pairs out from Old Navy too quickly!